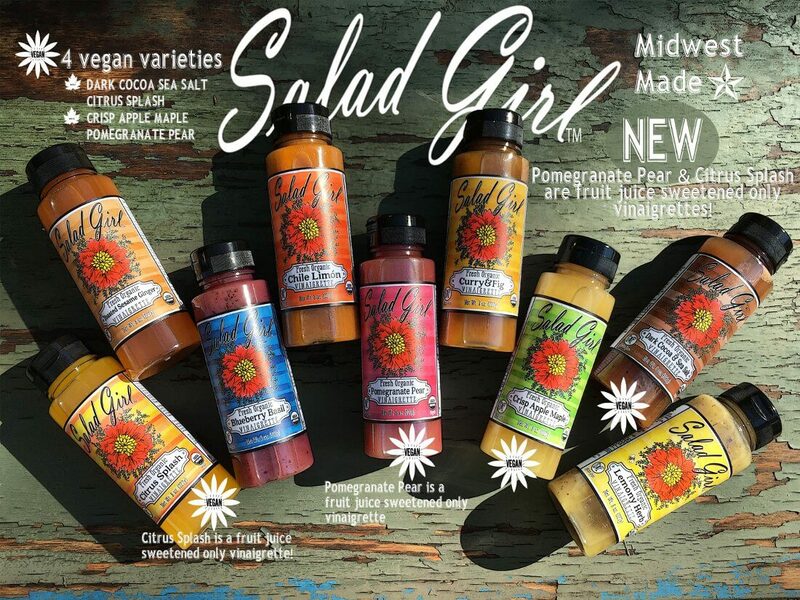 For this week’s Customer Corner, we are excited to feature Salad Girl Dressings out of Willernie, Minnesota! Their fresh organic salad dressings come in a variety of flavors that make our stomachs growl. Who could resist Dark Cocoa Sea Salt or Curry & Fig? 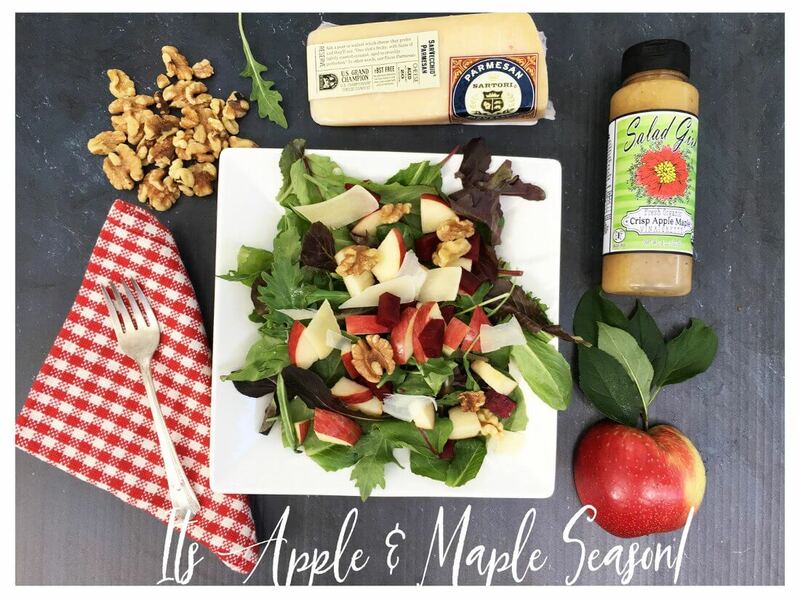 We are thrilled that Maple Valley’s syrup is featured in two of Salad Girl’s delicious dressings. 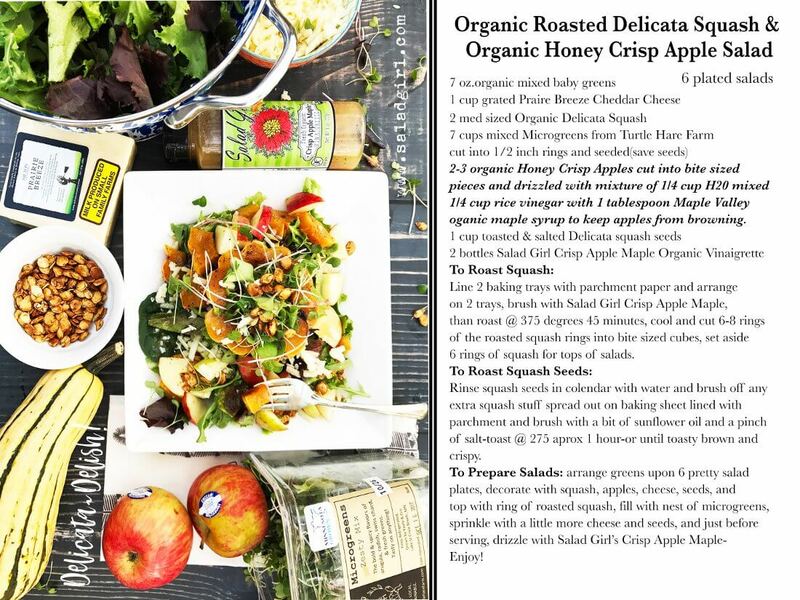 Also, be sure to check out their Organic Roasted Delicata Squash & Organic Honey Crisp Apple Salad recipe, complete with tutorial video, in the post below! If you live in the Midwest, don’t forget to pick up a bottle for dinner tonight. If you aren’t in the Midwest, you can still order some bottles on their website, or follow them on Facebook, Twitter, Pinterest, or Instagram for mouth watering updates. Bon Appetit! The Salad Girl Fresh Organic Salad Dressing Company sprouted from a summer job that I had as a teenager. In the early 70’s, I was working as a dishwasher at Maddens Resort in northern Minnesota. All summer long, when I wasn’t tediously washing dishes, part of my duties were to assist the “Salad Girl” with her chores. The Salad Girl, who was a few years older than I, had worked her way from dishwasher to her position. Patiently, she taught me how to peel a carrot in under 8 seconds, how to carve a beautiful rosebud out of a local radish, and how to artfully arrange veggies for the resorts famous relish trays. But, my favorite part of the Salad Girl’s job was when she crafted the “House Made Salad Dressings”. I would watch in awe while she carefully measured and whisked together a variety of delicious and fresh ingredients to magically create the best tasting homemade dressings and vinaigrettes! Oh, how I wished I someday I could do that job! Fortunately, the odds were in my favor. The “Salad Girl” needed to return to college before the end of the summer. So, I was promoted to the roll for the rest of the season! At that time, I had no idea that this chance introduction to fresh produce preparation would lead to a life-long love for eating and preparing fresh, organic salads. Also, that one day I would pay homage to this wonderful job by naming an organic dressing company after it! My husband Jim and I put ourselves through college and art school running “Obscene Cuisine”; an organic catering business. Hand crafting unique salads with home-made, fresh artisan vinaigrettes and fresh, seasonal, organic ingredients was definitely my forte. Soon, our customers and family members and friends began ordering my vinaigrettes for parties and as gifts, always commenting on how nice it would be to be able to buy a fresh organic salad dressing made without added preservatives, cane sugars and high fructose corn syrup at their local market. I often dreamed of bringing my recipes to the marketplace. By chance, I ended up painting a mural for one of the most prominent grocery stores in our town; Kowalski’s Markets. When I finished my artwork, I presented my line of organic fresh salad dressings to the owners. They were so gracious; setting up a meeting for me with the stores new product category director. Then, I made my presentation to corporate management. They loved my dressings and invited us to bring them to their refrigerated produce shelves once we had them bottled! Jim and I spent the winter of 2006 taking classes on how to start a business and bottle our product. We began meeting with folks in the local food community in our city. A wise business owner suggested we test the waters to see if there was truly a market for our dressing. So, in the summer of 2007, with loads of help and much encouragement from family and friends, my husband Jim, son Nick, and his wife Anna, rented a small kitchen at our local armory. There we began bottling our preserve free, uncooked, fresh organic vinaigrettes. We set up a booth at one of the coolest farmers markets around, in the heart of downtown Minneapolis, the “Mill City Farmers Market”. To our delight, our fresh organic salad dressings sold out every weekend! One good thing led to another and we were invited, as promised, onto the refrigerated shelves of eight Kowalski’s Markets. By March of 2008 we leapt from the stepping stone of our small commercial kitchen, to being crafted by a local organic co-packer. This enabled us to scale-up production & fill our first order for all eight of the fancy Kowalski’s Markets! Salad Girl actually became the first Certified Organic Fresh Dressing for Fresh Greens on the refrigerated shelves in Minnesota. From Kowalski’s Markets, we expanded to Twin Cities Whole Foods Markets, Lunds & Byerly’s, and almost all of our neighborhood co-ops in the Twin Cities. In the past few years, we have gained shelf space at all Whole Foods Markets throughout the Midwest. This includes nineteen stores in Chicago and its surrounding suburbs. Also, we are sold in Minnesota Hy-Vee and Target stores. 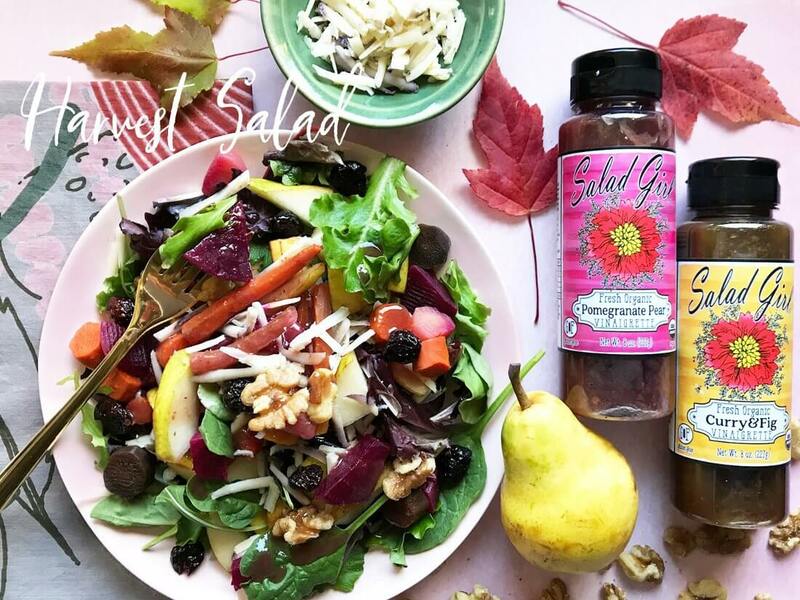 Our delicious assortment of Salad Girl Organic Salad Dressings are inspired by seasonal garden flavors and colors, and are made with only the finest & freshest organic ingredients sourced as close to home as possible. Salad Girl dressings are preservative free, non gmo, gluten free, soy free, cane sugar & corn syrup free, vegan, certified kosher and organic. We are so fortunate to be able to offer our vegan customers who don’t consume organic honey, two amazing fresh vinaigrettes crafted with the organic goodness of Maple Valley’s beautiful and high quality organic maple syrup: our autumn seasonal favorite, Crisp Apple Maple, and our delicious balsamic-like vinaigrette, Dark Cocoa and Sea Salt. Salad Girl’s inventive and vibrant flavor combinations will not only complement fresh greens, vegetables, and fruits but will add an incredible flavor blast when drizzled as a finishing sauce for fried rice & veggies, couscous, quinoa, ramen noodles, and fresh pasta. Also, they are marvelous as a marinade and dipping sauce for grilled meats, poultry, and fish. 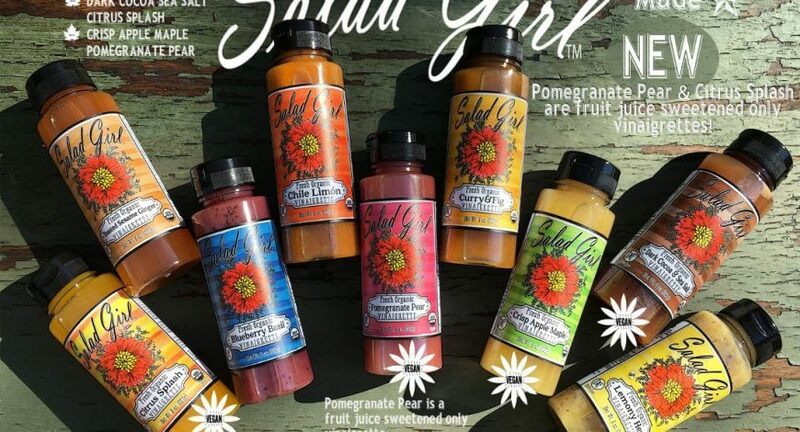 The Salad Girl Organic Salad Dressing Company believes that eating fresh, organic goodness benefits us individually,communally, and environmentally. We are committed to bringing healthy, safe, and tasty organic products to your table.